The book repeated myths about cats that were discredited years ago. 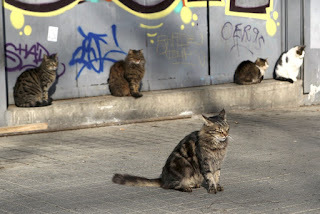 The authors of “Cat Wars” make no secret that killing millions of cats is their goal. Eighty percent of Americans believe that it’s more humane to leave a stray cat outside than to catch and kill her. This country will never accept large-scale killing of outdoor cats. Mass killing doesn’t work ; populations rebound quickly. Cities and counties have spent millions of taxpayer dollars on catch-and-kill efforts for decades. Trap-neuter-return programs do work. Adopted by more than 600 communities (and counting), they humanely stop the breeding cycle and have been scientifically proved to decrease the size of colonies over time.